The Island of Avalon as descibed existing 104 nautical miles from a bifurcated line in a southern angle at 13 degrees. 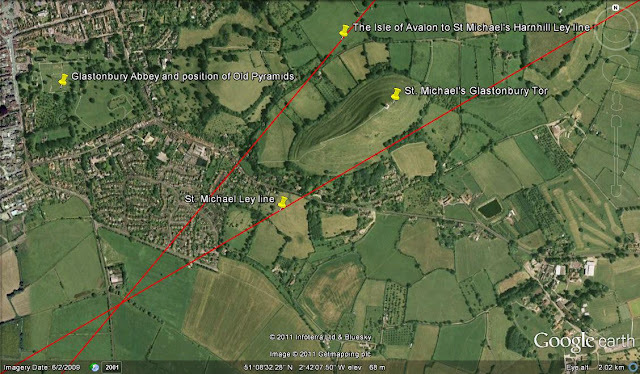 The line pointed out by Melkin in his prophecy is bifurcated or forked at the Avebury stone Circle cutting the saint Michael Ley Line and runs through Montacute as directed by Father William Good a Jesuit priest. The Distance to the Island of Avalon from Avebury the largest stone circle in the world is exactly as the prophecy of Melkin had predicted. The design as directed by Melkin which leads to Burgh Island 104 natical miles from Avebury on the coast of southern England that used to be known as Michael's rock. Showing the bifurcation at Avebury stone circle on the St. Michael ley line and the angle is just 9 seconds off thirteen degrees (sixty seconds in one degree) as the Prophecy of Melkin has directed. Avebury Stone circle within which the Joseph line Bifurcates with the saint Michael Ley Line. 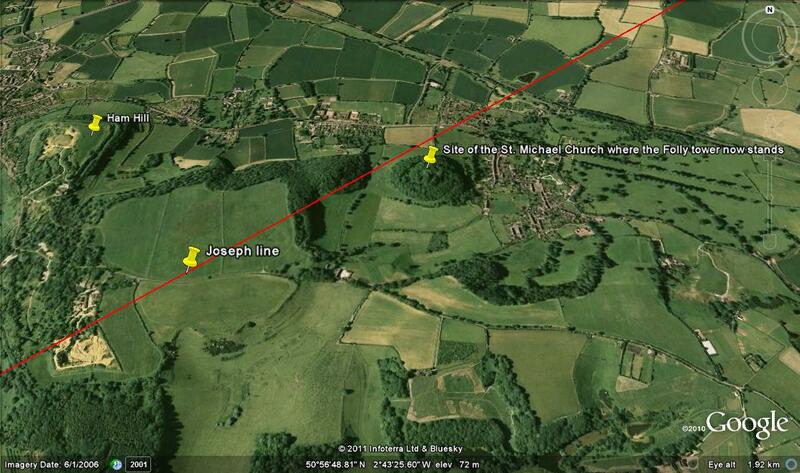 As father Good informed us that the Joseph line would pass through Montacute as it was a Templar marker church. 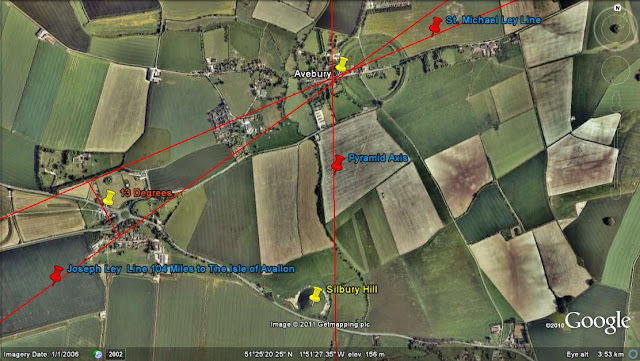 The Montacute connection to the Glastonbury Pyramids and the Ley line, that Melkin has shown us leads to Avalon. Father William Good, died at Naples in 1586, and was buried in the college of the Jesuits in that city. Father Good wishing to pass on the small nugget of information said that Joseph of Arimathea is “hidden carefully in Montacute”. It is possible that another such young protégé was confided in and entrusted with pertinent information about Brent Knoll as a marker also being on a line that intersects at Harnhill as does the St. Michael’s Rock through Glastonbury line. The intersection point on the pyramid axis, being the only point defining the size of the pyramid, with a circumference that is tangential to all three sides. However, had it not been for what was inscribed on one of the pyramids and the supposition that Arthur was reportedly buried between them, we would never have found the St Michael's Mount, Brent Knoll, Harnhill, Ley Line, as this information would have disappeared with the pyramids, without anybody remarking upon what was inscribed upon them. Let us look however at the connection with Montacute and the actions taken by previous ‘life time possesors’ of the same information that Father Good had been trusted to pass on. It becomes clear that before to Father Good’s time, an attempt had been made to establish Montacute as the most holy site by the finding of a holy relic. This seems to be a completely arbitrary act unless an Abbot or monk had prior information about the sanctity of who was purportedly laid there. The only certain information passed down to us, was that Joseph of Arimathea was buried, ‘very carefully in Montacute’. It becomes apparent that the inclusion of Hamdon Hill being named after Montacute as the precise location was probably a later interpolation following the discovery of the Black Rood of Scotland, otherwise known as the Holy cross of Waltham. The coincidence of this find having great similarities to the discovery of the leaden cross that was fabricated to establish King Arthur's Avalon as Glastonbury. Holyrood Abbey, founded in 1128 by King David I of Scotland, once possessed a fragment of the original holy cross from Calvary brought by St. Margaret to Scotland from Waltham Abbey and known thereafter as the Black Rood of Scotland. Supposedly the right hand man of King Canute 1016-1035, a man called Tofig had a vision and found a large black flint crucifix -The Holy Cross, on a Hill at Montacute, he then took it to Waltham. He put the cross on an ox-cart, but the oxen would only go in one direction and would not stop until they reached Waltham and there it was housed in the Abbey. It was then re-appropriated back from the Scottish by the English in 1346 to Durham Cathedral as one of its holy relics. The Black Rood of Scotland disappeared at the Reformation, while at the same time, the same fate befalling Waltham Abbey's Holy Cross. The reason for relating these points is, firstly, the Holy Cross of Waltham, originally found buried at Montacute, seems to have been transformed on its journey to Scotland from a flint object into the actual Cross from Calvary, and secondly, that coincidentally becoming intertwined Scotland's Holy Rood and the cross which was dug up at Montacute were both black, thereafter leaving for posterity a complete muddle of fake relics. However, to have located such a holy relic in Montacute in the first place would have certainly added credibility to the possibility that Joseph of Arimathea also was buried there. Probably what really transpired was that one of Father Good’s predecessors from Glastonbury, (Montacute being a possession of the Glastonbury Monastery), while in possession of the same secret information as William Good, tried to find Joseph of Arimathea in Montacute, and not wanting to turn up empty-handed, enacted very much the same deception as his other brothers of Glastonbury had done by fabricating a lead cross for King Arthur. Somebody within the Glastonbury institution at some stage knew of the connection, with Joseph of Arimathea and Montacute; a deception of a discovery was organised but it did not have the desired effect of finding Joseph. The deception did not materialise as intended and instead, a cross was found, with stories of miraculous circumstances and then an early date apportioned to the find so that Pilgrims could be persuaded of Montacute’s sanctity. In fact it would not be going too far to postulate that it was the same Abbot responsible for both deceptions. This was most probably Henry de Sully, Richard I’s nephew, Abbot of Glastonbury who was the perpetrator of the Arthur fiasco not forgetting Richard was Eleanor’s of Aquitaine’s son who appointed him not so many after Henry Blois’ death. It was probably Henry of Blois, as we have covered, who originally obtained this information however, from Melkin’s geometry contained in Eleanor’s Grail book and it was passed on to Henry de Sully. There is a small possibility that this clue was given in extant Melkin manuscripts at Glastonbury and kept quiet so as not to detract from Glastonbury’s monopolisation of Joseph. There is though, partial evidence for the Grail book having contained geomatria that has come down in the form of the Grail tables, these of course found in the geomatria of Chartres Cathedral and the three table’s connection in relation to Arthur obviously been woven in to the Grail romances. These shapes of the tables are round, square and rectangular possibly reflecting or acting as icons for the different approaches toward Gnosis or full consciousness and are expressed in a dimensional form. This can be expressed in many ways but the simplest would be that the round spiritual and the square intellectual both fit within the rectangular expression of finite or Biblical time, which we will get to shortly. The one fact that we can draw from this Geomatric clue of Montacute is that the Montacute connection to Joseph of Arimathea was prior to the time that there was a proliferation of St. Michael dedicated churches. This seems to indicate that the present day St. Michael's Hill at Montacute on which a St. Michael church was built has only had that appellation since the early 1400’s and hence the reference to Hamden hill or confusion with nearby Ham hill. get translatgDictionaryshows that the Hamden Hill, mentioned in this text, is referring to the one we have already established that is called St Michael's Hill, which, as the quote reports had a Chapel on it. However, this is clear for two reasons, the first being that the proliferation which makes up the design of St. Michael churches that we have previously established, did not appear until the very late 13th, and early 14th century and was not mentioned at the time when the holy cross of Waltham was fabricated. St. Michael's Hill was not named, and was thus called Hamden Hill at the time. Hamdon Hill today is an Iron Age hill fort and nowhere near as outstanding in conical prominence as the present-day St. Michael's Hill, nor could it be termed revered. The present-day Ham Hill is the largest hill fort in Britain 0.73 miles from the Ley Line running from Avebury. However the line we have been sent to find, tangentially touches St.Michael’s hill at its base, 200 yards from where the chapel stood as we can see in figure 24. 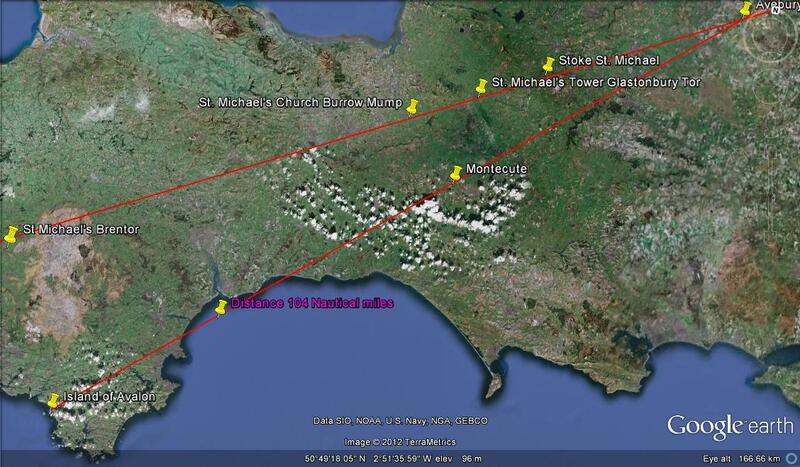 The Ley lines length of 104 miles runs from Avebury to Burgh Island as seen in figure 23. 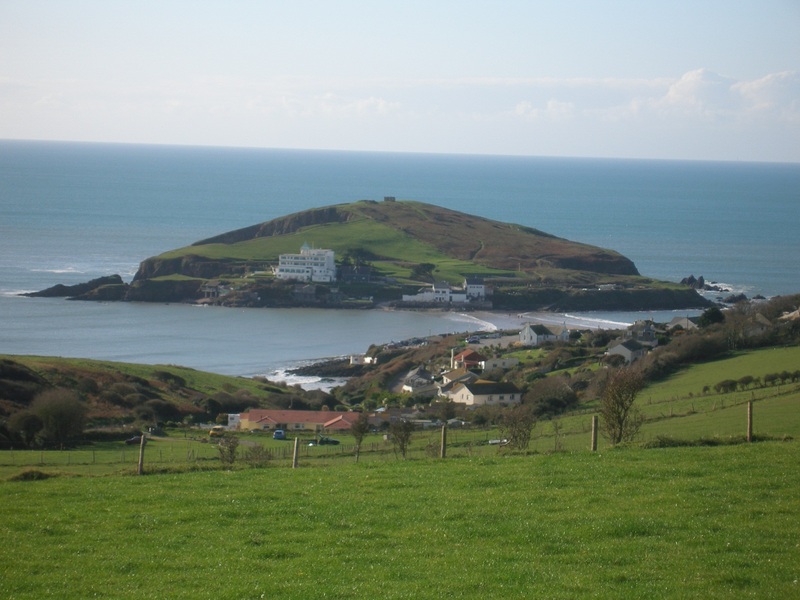 It now becomes obvious that the intended meaning of ‘hidden carefully’, relates only to St. Michael's Hill as part of the Ley system acting as a marker on the ley line, for the long awaited discovery of Joseph of Arimathea’s tomb on the Island of Avalon in Devon. Thus far go the words of that man (Father Good); as I said, he signs his name in his own hand under these things: I copied them down from the manuscript itself when I was a pupil of the same Anglican college in Rome, and always I kept them safe with me, across sea and land, amid the most savage persecutions of heretics. Nevertheless, it points towards that mount named Hamden Hill, on which some claim the tomb of St. Joseph of Arimathea to be, the sanctuary on that mount was kept safe for some time, built among the sacred and revered places of England. In fact I remember when sometimes I myself would traverse that mount, a certain old man who lived not far from that place would receive me through trust in my worthiness, often, during the reign of Elizabeth the heretic, to visit that place, and there, in a particular place he was accustomed to pray on his knees. It is interesting to note that the quotes ‘The monks never knew for certain the place of this Saints burial, or pointed it out’, and ‘even perhaps to have been buried there’ tend to denote a certain acquiescence in Father Good’s day that previous generations of monks had fabricated the whole legend. It would seem that the subterranean chapel in Glastonbury might have been an attempt at establishing a place of worship where Joseph was supposed to be buried. However, as we posited earlier, without the discovery of the Grail for all to see, this would lack credibility with pilgrims. As Father Good bears witness, the miracles which were prophesied by Melkin and which were supposed to happen at the unveiling of the grave, were already taking place at this underground chapel, but not even Glastonbury would have the effrontery to fabricate the Grail. Father Good, although he attests that Glastonbury is Avalon as we have seen previously, is unconvinced that Joseph is actually buried there, thus his investigation into the Arms of Glastonbury. The fact that Maihew went to Montacute circa 1620 and witnessed a man on his knees praying indicates that maybe the chapel was still standing then and his reference ‘in a particular place’ is meaning St.Michael’s hill as opposed to Hamden hill also known as Ham hill. Possibly subsequent searchers being newly appraised of this hitherto un-published clue, dismantled the chapel to search beneath for the Grail. This does seem likely as all the copies of Maihew’s Trophea were meddled with, to avoid this information being spread abroad. The very fact that the monks did not point out the site in Glastonbury and that there was equivocation as to whether Joseph's remains were in Montacute or Glastonbury (even by the possessors of the Montacute clue), leads one to deduce that there could have been a general suspicion of fabrication even by the monks. It would surely seem as if an attempt had been made, prior to Father Good’s days, to establish an underground Chapel to bring pilgrims into close proximity with Joseph believed to lie within the grounds. How old were these pyramids and who was originally buried in them, and why were the markings on them, plainly legible though not wholly intelligible? John of Glastonbury, always ready to promote the Abbey and its holiness then goes on to relate a story of Rainaldus who, to escape persecution in the Holy Land by a Sultan, has to return to Glastonbury and collect a glove full of earth to give to the Sultan, to relinquish him from his debt and punishment. So John has the Sultan say ‘those who live there do not know what virtue there is in that earth, anyone, however great a sinner among 1000 men, if he is buried there, will hardly suffer pains of hell’. This continual self-promotion has continued to the present day with apocryphal, untrue claims. Here again, is an instance of England's connection with the East and it makes one wonder if there is a prior knowledge or acceptance of Glastonbury anciently being hallowed ground with an eastern connection. What were two pyramids doing in Glastonbury and what was written upon the largest that was so unintelligible yet clearly written? Was it hieroglyphics or Hebrew? Before we delve into the relationship between England of the present-day, and that of Neolithic man with the East, we should look at the very prophecy that has become a large part of our investigation. Melkin, Melkinus Melchinus or Maelgwyn, for those wishing to associate him with the Welsh bardic tradition, we are told by Capgrave, lived just before the time of Merlin and King Arthur circa 550AD. Pits in his ‘De illustribus Britanniae scriptoribus’ circa 1620, describes him as an 'Avalonian', and calls him a British bard, historian, and astronomer. He dates him with assurance to 560 AD. Leland calls Melkin’s prophecy a ’fragment of history written by Melchinus an Avalonian’. Melki or Melchi having a biblical derivative ‘Melkizedek’ which means priest King while Melki, meaning King, and the sons of Zadok being those charged with serving in the inner sanctum of the Temple. There is so little known about Melkin that it is quite possible that Melkin and Merlin may be one and the same, or that Melkin himself was descended from the royal line of Kings that existed in Southern Britain from the time of Belerion. Melkin as we have mentioned was held in such high regard by chroniclers from mediaeval time’s, through to Elizabethan times and was referred to by some as an erudite scholar. Since most of his works are lost and the trail of his life seems to have been covered over, it seems highly likely that he was the last of the noble line descended from, Joseph of Arimathea and therefore expunged from popular cult status as a relative of Arthur's in the Saxon era. The power of prophecy or the ability to prophesy, especially that of the biblical prophets such as Isaiah and Jeremiah was not an attribute that was sought after, but often conferred on persons close to the royal line. Certainly biblical prophets endured much hardship speaking God’s words as if emanating from themselves and when they prefixed their words ‘Thus saith the Lord’, their peers were sceptical. They incurred the ire of their contemporaries who had contrary opinions or views to those which were being foretold that which would come to pass. The most important question in this exposé which only the reader will be able to decide at the finish of these pages is whether there is such an ability as prophecy. Obviously, most people have had the experience of Déjà vu and would conclude that time is not really understood, if one could glimpse events before they happened. Biblical Prophets, on the other hand are divinely inspired and rely upon divine intervention that can see across time. A divine voice speaks through those Prophets so it is not actually the Prophets faculties that are capable of future prediction, but God speaking through them as the force behind the prognostications. In the case of Melkin we are told by Helinand that he was informed in a vision by an angel of the Grail and through this method he was able to pass on the Grail information. If one was to exclude this avenue as being an unacceptable explanation of his possession of arcane knowledge of Ley lines, surveying techniques and the ability to write a book on the degrees toward enlightenment, then the reader must conclude that a body of knowledge existed which contained this information. If this is the case, are we to look on Melkin as a mere collator passing on ancient history and occult knowledge? The answer would seem to be that Melkin understood profound knowledge, the essence of which, the Grail was a reality. A divine plan existed for Melkin and he understood it. The Grail writers alas, only picked up certain facets of the truth to which the Grail related and thus we are left with a fractured mess of processionals, quests, strivings and searching’s, all of which empathise with the lot of man, yet do not convey the original truths that the account was meant to convey. Prophecy is one of the most misunderstood concepts of the modern generation and certainly most theologians have not paid much attention to what the essence of prophecy is, but have tried to rationalise the words that the biblical prophets spoke only in a historical context. Plainly the whole of Christendom is based upon the biblical prophets, as Jesus concurred by coming to fulfil much of what they had prophesied and thereby his Messianic position was confirmed. Many view the biblical prophets as purely relating to that which is now historical but it is the understanding of Biblical Time that will put prophecy in perspective. However, we will come across this later in our enquiry, but for the moment we need to establish if Melkin was of this same prophetic tradition. Did he actually have prior academic knowledge of the whereabouts of a ‘bifurcated line’ before he wrote his Prophecy related by John of Glastonbury? Was it entirely prophetical without any conscious knowledge of the directions contained within his prophecy? The second half of Melkin's prophecy is assuredly prophetical, in that it speaks of the future unveiling of Joseph’s sepulchre and the events that will accompany the discovery. It deals with the consequences of unveiling Joseph's tomb and infers a global reaction, the veracity of which, will only been known when it is unveiled at an appointed time in 2012 on a set date. However Melkin’s prophecy might be partially divinely inspired and partly instructional. If Melkin had been present at Arthur’s burial he would certainly know the lay of the land around the grave site of Avalon. This is described in his puzzle but does not explain how he was able to survey 104 miles across the landscape and take an angle from an invisible Ley line. So is his riddle less prophetical than instructive as if relating facts from a source? We can only conclude that it is both for he knows the outcome of the discovery and yet describes not only its geographical location but physical features of the island. If we assume that the passage giving the genealogies in John of Glastonbury’s Cronica is also from Melkin and from an ancient source, then this same source relating the Ley line information could be very ancient. Is it that Melkin had available three bodies of Knowledge? 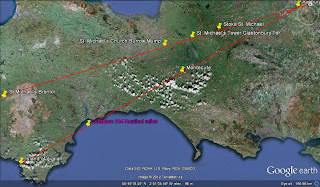 One British, from Neolithic man regarding Ley lines possibly derived from Zerah’s offspring, another involving Jesus and Joseph which included information relating to the Jewish heritage from the Temple with an account of Joseph’s arrival in Britain with the Grail ark and lastly an account covering the period from Joseph to Arthur. We can assume that the second-half of the prophecy is prophetical. Prophetical in the sense that it is foretelling of the global reaction, but maybe not divinely inspired as it could be asserted that anyone could predict a stir at the unearthing of Jesus's bones as ‘Abbadare’ in Melkin’s Prophecy is Jesus. It is Melkin’s references to biblical time which should convince us that he understood the purport of the material that Joseph brought with him concerning the Divine plan and later laid out in his Book of the Grail. Apart from his now famous prophesy, which, shortly we shall discuss and dissect at length, it is worth looking at what other references are made to his lost books. John Leyland says he saw fragments of Melkin’s work, even a volume of great antiquity while Bale, Capgrave, Hardyng and Pits either give the titles of the books, supposedly written by him or incidental added information. The three books which John Pits sites, ‘De antiquitatibus Britannicis’, ‘De gestis Britannorum’ and ‘De Regis Arthurii mensa rotunda’, could have been written by Melkin and within one of these three the prophecy probably existed and Bale confirms that it was Melkin who wrote the ‘Arthurii mensa rotunda’ which surely could be just an abbreviation of Pits’ title. It is unclear how much of the historical information that we have today regarding Arthur and Joseph was derived from the works of Melkin but these titles seem to concur that Melkin wrote a manuscript about King Arthur and the Round Table and also of British history to his time. None of these later chroniclers mention the more important ‘Book of the Graal’. So it would seem our assumption that the Book of the Gradali was the source for the French Grail stories left Britain in the Saxon era.The source for the Arthurian material that supplied Geoffrey and the Welsh tradition we should assume stayed in Britain but both originate from Melkin. Melkin then was the common source to both and hence the overlap of material. This would explain the Welsh corruption of Arthurian material until the advent of the French material. It would also explain another piece of evidence that appeared at the time of the Grail material in Britain. The ‘Acts of Pilate’ are different from the ‘Gospel of Nicodemus’ for they had been around since at least the fourth century and were originally written in Greek. The Gospel of Nicodemus seemed to surface around the time that Henry of Blois came from France; so was the Nicodemus material gleaned from Melkin’s Grail book? If so it would add to the evidence of the Graal material (that which explains the Divine Plan) originally having come from the Holy land with Joseph. The passage below, quoted in John's Cronica giving an extract on the genealogy from Joseph of Arimathea through to Arthur is most probably derived from Melkin, as this passage is next to that of Melkin’s prophecy in John's work and others relate it is from him. It also testifies to the proximity in relationship between the Grail stories and the material found in Melkin’s prophecy, and should go a long way to convincing the reader that, Melkin’s manuscripts and the Grail romances had a common source. This passage bears witness that King Arthur descended from the stock of Joseph. Helians, Joseph's nephew, begat Josue. Josue begat Aminadab. Aminadab begat Castellors. Castellors begat Manael. Manael begat Lambord and Urlard. Lambord begat a son, who begat Igerna, of whom King Utherpendragon begat the noble and famous King Arthur, by which it is evident that King Arthur descended from the stock of Joseph. Again on the same subject; Peter, cousin of Joseph of Arimathea and King of Organiana begat Erlan. Erlan begat Melian begat Arguth begat Edor. Edor begat Loth, who took to wife King Arthur's sister, of whom he begat four sons, namely Gawain, Agravains, Guerrehes, and Gaheriet. The first thing to notice is that the genealogy starts with Joseph’s Nephew and this raises the question of what relation was Helians to Jesus? We might find the answer when we look at Leonardo da Vinci’s connection to Avalon in a later chapter. Helians would indeed be Jesus’s cousin, being Joseph’s Nephew also. Joseph already had a son Josephes so why start the genealogy with Joseph’s Nephew? Jesus’ brothers were in Jerusalem with James, so what if this genealogy starts with Helians because he is Joseph’s son from an English wife. This liaison may have transpired on one of his trading visits to Cornwall and Helians son Josue, gives his offspring a decidedly Hebraic name because Amminadab was the father of Nahshon in the Davidic geneology. This is all speculation but if it was true, it would be the thread that joins the Pharez to the Zerah line genetically after a long period of separation. a book that contained Melkin’s prophecy in Britain and could be the evidence of such crossover material mentioned earlier. John of Glastonbury ends his quotation from Melkin with the words ‘thus far Melkin’. He then continues on to say that ‘also in this island of Avalon, which is called the tomb of saints, rest, Coel, King of the Britons, father of St Helen, mother of the great emperor Constantine, and Caradoc Duke of Cornwall.’ He then follows on to say ‘King Arthur rests there with his Queen Guinevere; in the year of the Lord's incarnation 542, Arthur was fatally wounded by Mordred in Cornwall near the river Camlann, was brought to the island of Avalon for the healing of his wounds, died there in summer, around Pentecost, and was buried in the monks Cemetery. We are able to see here in this last caption how John had ended, quoting directly from Melkin but continuing with most of Melkin’s material except for ‘and was buried in the monks Cemetery’,and‘King Arthur rests there with his Queen Guinevere’, which evidences clearly another example of his polemicism. The information about the tomb being occupied by Arthur’s forebears from Cornwall fits with the account that all the Kings were anointed from the Grail Ark which is also in the Tomb. It is interesting about John’s inclusion of ‘St Helen, mother of the great emperor Constantine’, because it was Constantine who developed the ’Edict of Milan’ which stated that Christians should be allowed to follow the faith of their choosing which of course is what Augustine had complained about the ‘Britains’, as we covered earlier. This passage however, does highlight that there was essentially an early southern tradition built upon later by the Welsh. Caradoc, who seems to feature more prevalently in the Silurian tales of knight’s, has his roots and those of King Arthur firmly fixed in Cornwall. After all, Arthur was the son of Uther Pendragon and Igraine. Igraine was wife to Duke Gorlois of Cornwall, at the time she conceived Arthur and therefore Arthur was illegitimate, but Cornish. How much John of Glastonbury has interpolated this additional information as is seen in reference to Guinevere, the time of year, the date for king Arthur and his ‘burial in the Monks cemetery’ after having thus confirmed ‘here ended Melkin’ we shall not know. Almost all of Christendom laid claim to St. Helen’s relics and her inclusion by John, could be his own interpolation mixed with Melkin's factual account. The St. Helen legend, made popular by Geoffrey of Monmouth, claims that Helena was a daughter of the King of Britain, Coel of Camulodunum. She gave birth to Constantine, but as history spells out, Constantine did not spend much time in Britain. However, Caradoc seems to have been supplied by the Melkin source, the same source that would have left Arthur with the southern and Cornish tradition, and Caradoc as Duke of Cornwall. Just to reiterate, when William of Malmesbury wrote his ‘De Antiquitate’ Joseph of Arimathea was not included in the text, except that some annotations in the margin by a later hand, related that he and twelve of the disciples had been sent from Gaul by St Philip. This annotation had been made sometime in the middle 13th century and tells how Joseph built the wattle church at Glastonbury and that the church was dedicated to St Mary. The Church then fell into disrepair and was then renovated by two Roman missionaries called Phagan and Deruvian the same tale of events being told in St. Patrick's charter much later, with barely a mention of Joseph of Arimathea before that time. John of Glastonbury writing later included these annotations from a later hand interpolated into William’s work quoting from it as if it were all from his hand. John’s intention here is to have us believe that his source is entirely William’s work only and not that of interpolators to add credence and historical weight to Glastonbury propoganda. In fact John is swaying our opinion by saying this is the William of Malmesbury who wrote an account of the Abbey ‘from the coming of St Joseph down to the time of Henry of Blois’. Had it not been for the annotations, Joseph of Arimathea, leader of the band of 12 would have barely received a mention. There is another later marginal annotation that states that ‘Joseph of Arimathea, the noble councillor, with his son Joseph and many others, came to greater Britain and there ended his life and is attested to by the book of the deeds of the famous King Arthur’, and then again, another reference referring the reader to the fourth and fifth books of Geoffrey of Monmouth. This is quite strange since William of Malmesbury did not know the location of the Isle of Avalon and chose not to include any part of the Joseph story. Glastonbury Abbey where Arthur's bone are said to have been disinterred with a leaden cross which was faked in order to try and substantiate Glastonbury as the Island of Avalon. John of Glastonbury is primarily responsible for putting the whole legend together as we know it today, conglomerating the Gospel of Nicodemus and the Acts of Pilate, Joseph's connection with St. Philip, being extracted from the charter of St Patrick, Joseph’s arrival in Glastonbury, and the building of the wattle church. The wattle church substantiated and overstated in its method of construction purely based upon rationalising it with Melkin’s ‘cratibus’. William of Malmesbury's book ’On the antiquity of the Church of Glastonbury’ has not reached us in its original form, suffering many interpolations at the hands of the scribal polemicists at Glastonbury the forged book which must necessarily and manifestly have been composed fifty years after his death. Luckily we can see this by William of Malmesbury's third edition of his Gesta Regnum which he released circa 1140 in which he repeated verbatim much of which was in his ‘Antiquitates’, related by Adam of Domerham, and through this, we can detect later interpolations. William of Malmesbury tells us that the Bishop of Rochester after fleeing from York covered the wattle church in wooden boarding as a repair. This quite possibly was how William of Malmesbury viewed the repaired church when he visited Glastonbury, after having been repaired once by Phagan and Deruvian and then again by St. David. The Rhygyfarch a Welsh text, relates that Glastonbury was one the churches St. David founded; this contradicting the Joseph tradition, but William aware of this assertion and being able to peruse many of the ancient manuscripts at Glastonbury was aware that it had a history prior to 500 AD. William wrote that David only visited Glastonbury intending just to ‘rededicate’ the abbey, as well as to donate a travelling altar as well as the Great Sapphire while en route and passing through. And while there he fortuitously had a vision of Jesus, who said that "the church had been dedicated long ago by himself (Jesus) in honour of His Mother, and it was not seemly that it should be re-dedicated by human hands". So instead, St. David, we hear, commissioned an extension to be built to the Abbey, east of the Old Church and he was probably not responsible for any rebuilding of the old church. The old church, with its wooden boarding is probably the state in which William witnessed it, even though in the ‘Antiquitates’ there is an account that it was covered from top to bottom with lead, but this could have been referring to the roof only or a protection of the wattle which like Cob crumbles when soaked. Whatever light the construction of the church may be viewed in, it seems likely that even before William of Malmesbury wrote, which was before the fire; the church’s construction became a focal point to concur with Melkin’s ‘cratibus’ in the time even prior to finding Arthur’s bones as this was physical evidence of the wattled church dedicated to the adorable Virgin and hence the very place of which Melkin prophesied that Joseph would be found. Glastonbury tor thought to have been the Island of Avalon or Insula Avallonis from Melkins Prophecy but is now shown to be the wrong Identification as the Island exist in Devon where Melkin directs us to. Certainly the church’s construction had already been overtly publicised but afterward through John of Glastonbury’s repeated confirmation of its construction being made from wattle, it seemed like overcompensation to marry ‘cratibus’ to wattle. It was the ‘Magna Tabula’ that Archbishop Usher refers to, that would have publicly associated Joseph's name with the chapel at Glastonbury other than the fabricated St. Patrick’s charter. The Magna tabula was a folding wooden frame containing two wooden leaves like the pages of a book and all six interior faces were covered in parchment manuscript that used to hang in Glastonbury Abbey which for the most part, quotes John of Glastonbury. It was put there for pilgrims to view and to confirm to public awareness, the heritage of Glastonbury. In the last section of this Tabula, after following John of Glastonbury's work, there is new material added and is headed, ’of the Chapel of Saints Michael and Joseph, and all Saints, who rest in the cemetery’, followed on by a commentary that Abbot John Chinnock in 1382 had repaired this Chapel that stood in the midst of the cemetery. This Magna Tabula related the tales of King Arthur, St Patrick’s charter, Joseph of Arimathea and the translation of the body of St. Dunstan, among many other things, bringing into the public domain and to all pilgrims, the association with Joseph of Arimathea. Not only were the pilgrims now made aware of the original church that Joseph had built, by the mystical instructions on the ‘bronze plaque’ but the placing of the Tabula within the abbey, publicised its propaganda to every visiting pilgrim. To the North of the Lady Chapel stood a column (Father Good relating that it was a Cross), close to the site where the pyramids used to be, the column foundations being uncovered in 1921. The function of the bronze plaque placed on the column was duly following the Glastonbury tradition of self-promotion and propaganda. The column ostensibly being built to indicate the exact site of Joseph's church. The existence of the column still standing with the bronze plaque can be traced back to the second quarter of the 17th century, and relates the story of the arrival of Joseph of Arimathea, the dedication of the original church by our Lord in person, and how the church was built to honour his Virgin mother. It also related the vision of St. David, the positioning of the Chapel added by him, and a gift from him, of the sapphire. The plaque then goes on to relate; ‘and lest the site or size of the earliest church should come to be forgotten by reason of such additions, this pillar is erected on a line extended southward through the two Eastern Angles of the same church, and cutting off from it the chancel of the aforesaid. And its length was sixty feet westward from that line; its width twenty six feet; the distance of the centre of this pillar from the middle point between the said angles, forty eight feet’. The plaque seems to have carried out its intended function, J.Blome on 10 June 1345, having obtained his royal permit, set out to search for Joseph within the Glastonbury grounds, most probably making full use of the information provided by the plaque, thinking this is relevant to Melkin’s instructions to find Joseph. So it was after the fire of 1184 that the stories of Joseph blossomed and a presumption that he would be buried close by his own church was generally assumed. The Isle of Avalon having found its geographical position at Glastonbury, was all part of Glastonbury re-inventing itself. When we add these facts with the leaden triangles and squares on the church floor, the circles of portentous prophecy, bifurcated lines, a southern angle and a meridian from Melkin, together with, lines extending southwards through two Eastern Angles indicated on the plaque; it all leads one to believe that these are purposeful directions, intended to lead the quester to Joseph's burial site which of course held the Holy Grail. The placing of the plaque, not only confirming for pilgrims in posterity, the longevity and the veracity of Glastonbury's long-standing association with Joseph, but also for evermore, keeping the quester’s gaze firmly fixed within the confines of the Glastonbury Abbey grounds. Unravelling the Medieval Latin of Melkin’s prophecy. The reader must now be aware of the impact that Melkin has played in British history, so let us now turn our attention to what it was that he intended to convey to us specifically in his English prophecy. Melkin has surely set out to manifest the whereabouts of Joseph of Arimathea's entombment, leaving specific and precise instructions within that prophecy. For the last 600 years researchers have tried to interpret, disentangle or make sense of this riddle from the obtuse Latin phraseology. They have tried to translate it into something coherent so that the phrases link together and provide meaning to the reader. There is no doubt that Melkin wanted us to understand this riddle, the clues in it are extraordinarily accurate. The Latin is archaic and grammatically incorrect, so, not only is it necessary to establish the geometry that lies beneath the riddle and the meaning of individual words on different planes, but we need to try and unravel Melkin’s intended purpose, while also attempting to understand the mind of the man who wrote it. Melkin’s puzzle is literary genius conveying information on different levels and one can only wonder what his thoughts were as he constructed this riddle. Let us briefly recap the current situation; Ictis had a huge vault within the Island and Joseph of Arimathea was to be buried with ‘duo fassula’ containing the blood and sweat of Jesus. Joseph is said to have brought with him what has since become known as the ‘Holy Grail’ to Britain in around AD 37. Since the advent of the Romances, the ‘duo fassula’ and the Grail have become one and the same. Joseph came to proselytise the British. In part probably owing to his previous links, for he introduced Jesus as a young man to Devon and Cornwall, a kingdom known as Belerion by Pytheas. The Island that Pytheas describes, where Joseph and King Arthur are now buried, is the Isle of Avalon, but it seems others are there also as we assume this was attested to by Melkin. 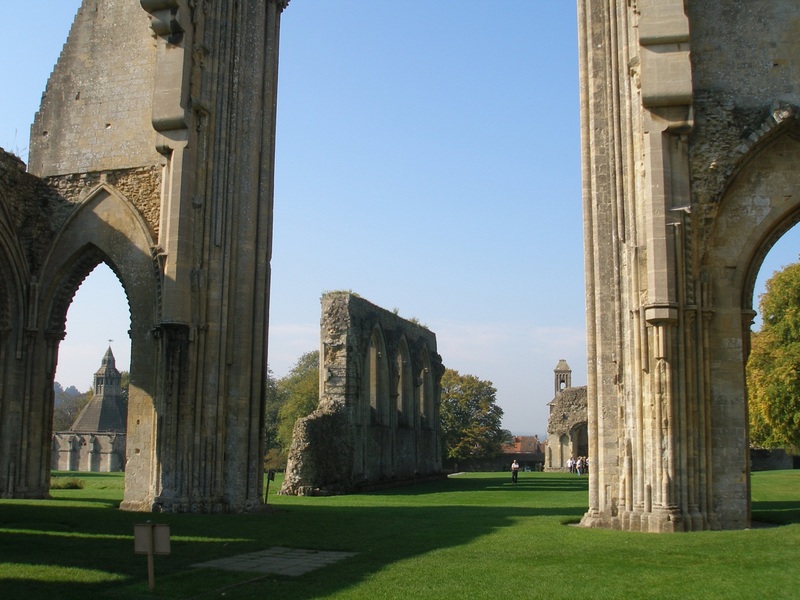 Many commentators have assumed that Joseph was buried near the Old Church, in the grounds of Glastonbury Abbey and for many years the institution at Glastonbury Abbey has proactively encouraged such a position. It seems, that Melkin has required us to solve a riddle for which he may have intended us to keep searching at Glastonbury until now. If this was the case, how could he be sure that Joseph would be found eventually? The answer and his confidence lay in the fact that he was cognisant that the Grail was a ‘Grade or Stage’ in ‘Time’ that would inevitably come as part of a divine plan? It was Melkin who wrote the ‘Book of the Grail’ which contained this Hebraic occult knowledge that the Romance writers could not comprehend and thus allegorised, building and elaborating on the substance therein, using metaphor and imagination. It seems that Melkin's prophecy, which cannot be traced back earlier than John of Glastonbury's ‘Cronica’ is based upon a body of information concerning Devon and Cornwall (Belerion). This historical sequence of events concerned Jesus, who as a single person, has changed the world as part of a divine plan set in ‘Biblical Time’. This historical source information was partly used by the French Grail writers who were not aware of Jesus’s body in Avalon, but knew something to do with him was brought from the Holy land to England. In the true prophetic tradition, Melkin prognosticates on what will take place when Joseph's tomb is found indicating that if not wholly, then in part, he was divinely inspired. 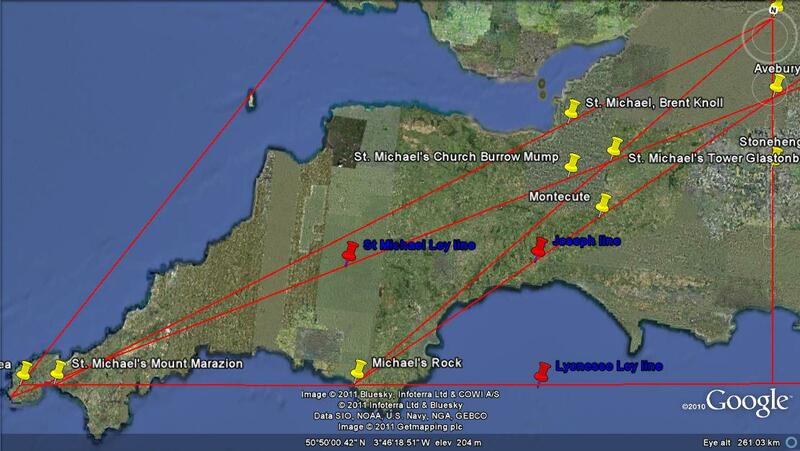 The Neolithic and Medieval renovated Ley system within which Joseph is buried has been accurately planned out and surveyed. Melkin has knowledge of the Ley system and the distances and angles within it. It appears that Melkin, is the source for all original Arthurian information that has come down to us today. He wrote his prophecy and therefore he is solely responsible for renaming Ictis as Avalon. Avalon connects Arthur and Joseph both being buried there and Melkin’s genealogy in the ‘Estoire’ and recorded in John’s Cronica, connects them in a bloodline. Joseph is a blood relative of Jesus who is inextricably linked to the Grail, while the Grail, as the modern world understands its substance, is buried with Joseph and Arthur in Avalon and this entire tradition has stemmed directly from Melkin. How is it that a Monk knows so much, as to understand the essence of the Grail back in the sixth century and know that Jesus is buried in Avalon and also have insight into occult knowledge concerning God’s divine plan and a grasp of Biblical Time? Were Jesus’s remains witnessed by Melkin at the burial of King Arthur? So let us look at the small fragment of his understanding that has come down to us, for as we further our enquiry, we will see that it is very probable that the Grail book is about to surface as the book of the Law did, when the Jews returned from captivity. Buy the book to understand Melkin’s puzzle and witness the accuracy of Melkin’s Geometry and discover where the body of Jesus and Joseph of Arimathea are buried.